Favourite bike/s you’ve had Angriest bike was a heavily modded 1977 Honda xr75 (had more suspension then, than my Montesa has now). Most pleasurable bike to race was 1981 Suzuki Rm250x. Most fun bike to race is the Montesa Vr 250, but I’ve put on too much pudding for the little 250 now. Time to borrow a big-bore till I trim up! Dad ? (eg: treasured memories, titles you hold, best win, best event (as rider or spectator)…anything MX related that sticks in your mind from years gone by (or last week…haha) State or national #1 have always been out of reach, or out of my luck. 1982:- 2nd Prince of the cross (injured and first year of senior mx). 2000:- 2nd State vmx Open class. Many top 5 finishes in state and national events in jmx , mx and vmx. (always the bridesmaid, never the bride). Best race was the Allstar race at the 2000 state titles at Noble Falls. Racing for about 4th and 5th position against the Suzuki Tm250 mounted Shane Thompson. The Montesa 250 nipping at his heels the whole race. Positions swapped several times with the Montesa having the power in the straights, but then the Suzuki would have the power out of the corners. Eventually, I got the out-brake I needed (was on the last lap too) to get in front and stay in front and beat Shane to the flag. Thanks Shane for one of the best races I’ve ever had! Most memorable (funny or painful) Motocross accident Bunbury Superbowl 1981:- got the “altitude” record for the evening. After watching the 250’s “only just” clearing the second jump in a set of quad-jumps, I decided, time for a 125 to do it. And if I was going to make it, I would have to wring the neck of the 125 to do the same job. Little did I realise, the 250’s were braking before the takeoff. DOH ! I hit the take-off jump flat out, cleared the second jump easily, too easily I thought, then bellied out on the top of the 3rd jump knocking the wind out of me. Whilst getting my breath back I could hear the commentator talking about the new record. I finished the race, this time slowing before the take offs! 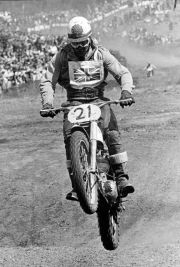 Family Motocross History (who else rides or is involved in MX in some form in your family) Father:- Vic James still racing after all these years. Father-in-law:-Ray Wann still gets the Bultaco out from time to time.